"There are plenty of love stories that can whisk us away from the less-than-perfect reality of our lives. "Flaherty's Crossing" not only entertains, enlightens and inspires, but returns us to Earth with a new appreciation for those we love and what we have. I am delighted to have the privilege of adapting Kaylin McFarren's impressive first novel for the screen." "One crushing truth often leads one to more. "Flaherty's Crossing" is the story of Kate Flaherty as she tries to come to terms the truths that surround her life that she has often ignored. With her father revealing facts about her mother, a car accident sending her into soul searching, Kate's first response is to run away from it all, only to find running never changes anything. "Flaherty's Crossing" is a powerful and inspiring read, highly recommended." It was apparent to me as I read Flaherty's Crossing by Kaylin McFarren, that she poured her heart and soul into this story of love, healing, and faith. Ms. McFarren evokes strong emotional responses from her readers, and I can truthfully admit that I cried at the end of the story. Not tears of sadness, but rather, tears of pure emotion and a feeling that the author truly connected with me. And that I felt the same emotions while reading the book as she felt and wanted to convey while writing it. And isn't that what writers truly want to achieve? Well, Ms. McFarren accomplished that with her wonderful book, Flaherty's Crossing. The main character, Kate, who grew up feeling unloved, almost loses everything because she is not able to forgive or trust those closest to her. It takes her father's death, a car accident, a good knock on the head, and her husband almost leaving her before she realizes what is most important in life. She learns to forgive and to trust her heart. And once she is able to do that, a whole new world awaits her. I truly loved this story and the way it was written, with such depth and emotion. I give this a well-deserved five stars. It was a fantastic book! "Flaherty's Crossing is truly an emotional roller coaster ride. McFarren did a fantastic job drawing the reader in, keeping you wanting more. In this heart-wrenching tale, of self discovery to forgiveness, you will not be able to put this book down until you have finished it." "The book is rather short, only 234 pages, but it is packed with the full range of emotions and will keep you hanging on every word. The characters are very vividly written and the author knows how to surprise you. I am so glad I was given the chance to read this book. I think everyone would enjoy this book, not just those who usually read this genre. I know I will be reading it again and again"
"Jump into this novel for a roller-coaster of a a ride! From the gossipy neighbor to the diner scene, from the confession to the car crash... Kaylin has crafted a page turner of a novel with her deep characters and mind boggling narratives." "This book had me smiling, crying and every emotion in between. I truly loved this story! I don't think that I could say that enough. This author really knew what to write and how to capture my mind and my heart completely so that I could feel every emotion, every touch, every word that Kate Flaherty heard or felt. POWERFUL!" "This book is full of emotion and characters that really come to life. I feel like Kate and Drew are part of my family now, and that is pretty amazing for a 250 page book. Also I found this book kept surprising me. As soon as I though I had something figured out, it was different than I thought. But it was the relationships that kept me reading above and beyond the plot; even though the plot was wonderful, the relationships were outstanding. I look forward to reading more of Ms. McFarren's work in the future." "Flaherty's Crossing by Kaylin McFarren is a deeply moving novel of not only love, but also of forgiveness. Kate, a fiercely independent married artist with a longing to be loved, receives a call she has been dreading, her father, Collin Flaherty, has passed away. Kate is already struggling with her marriage and is now faced with doubts about who her father truly was and if he stopped loving her when her mother passed away. Kate's husband Drew, a high-powered attorney rapidly moving up the corporate ladder yet still overshadowed by the achievements of his now deceased father, is striving to make their marriage work and to convince Kate that he can indeed be there for her, believes in her, and loves her. Flaherty's Crossing is a rollercoaster ride of events and emotions as McFarren delivers a delightful cast of characters, which include friends, family, hospice workers, and Kate's gossipy neighbour Wanda, each delivering a special message to the narrative. The diner scene is a stroke of literary brilliance as Flaherty's Crossing reminds the reader it is never too late to change, apologise, and forgive; a narrative that reminds one that love transcends time and place and can never die. 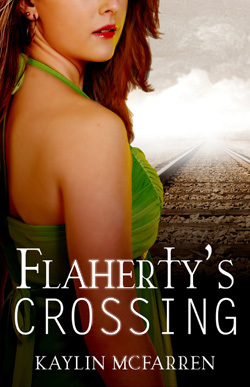 To anyone looking for an insightful and uplifting novel, I highly recommend Flaherty's Crossing." "I enjoyed the book and the tittle was appropriate. It was beautifully written and covers topics that can affect our lives. It was very easy to follow, and there was a lot of emotion throughout the story. Pick up a copy of this fantastic book. You will not be disappointed." "The plots were powerful, emotional, and eye opening. It made me think about what really should be the priorities in my own life. I enjoyed the journey through Flaherty's Crossing and recommend everyone to read this great piece of art. Pick this book up; you will not be disappointed." "I really enjoyed this one and found it to be inspiring. I'd recommend it, as I think a lot of people can relate to this one in some way; a very touching story." "I'm so glad that I had the chance to read this book. It made me think about my own 'crossings' during my life and that's never a bad thing to contemplate. Pick this one up and you won't be disappointed at all. Kaylin McFarren is definitely someone I want to hear more from!" "I found Kaylin McFarren to be a very descriptive writer. She is able to describe people and situations in a clear yet interesting manner without becoming too wordy or boring. I would liken her writing style to that of Danielle Steele and I think her works will make a wonderful addition to the romance genre." "Flaherty's Crossing is an eye-opening ordeal that makes you want to re-prioritize the important things in your own life before it is too late. Kaylin McFarren has penned a powerful story, and I am grateful to have read such a wonderful tale." "Flaherty's Crossing was emotionally gripping. As I read along, my emotions were on a roller coaster ride packed full of internal and external turmoil." "The storytelling is exceptional, readers will find themselves trying to figure out whats going to happen next. It's a very tender and emotional story with the themes of forgiveness and having faith in oneself coming through effortlessly. This is a book that I would highly recommend to my readers. I give this one a 5 out of 5 apples from my book bag!" "I am a sucker for books about love and forgiveness. When I was sent a copy of this book, I fell in love with the cover. I wasn't expecting what I got when I started reading. The main character Kate was someone that I can identify with on certain levels. I never forgave my father for all the things he done wrong and most of my relationships have suffered for it. From the moment Kate has her accident until the end of the book, I couldn't put it down. I laughed, I cried and I was terrified right along with Kate." "Flaherty's Crossing goes beyond Kate's coming to terms with her father and her memories of him, and the obvious couple with relationship problems finding that they still love each other after all. McFarren not only realistically presents Kate's emotional roller-coaster, but also gets into Kate's husband's head, presenting male emotions within a troubled relationship. A well-written book, dealing with difficult issues of love, loss, healing, and faith, and never slipping into maudlin territory. A great debut novel." "When I first started reading this book I thought I was going to be disappointed. The opening chapter had me thinking it was the same old story of marriage going wrong and sudden flash of realization they want to try again. As I got further into the story I realized I'd made the wrong assumption. The first few pages made me wonder how the author was going to make the story last the full length of a book. I soon found out that Ms. McFarren knew exactly what she was doing and my interest was captured and drawn into the problems and turbulent thoughts of both Drew and Kate. The very ordinary start quickly turned to suspense and mystery and this particular sub plot threaded its way through most of the book. As each problem was solved satisfactorily, another bump in the road appeared to keep my interest in the story alive. I particularly liked the way both Drew and Kate's point of view brought different aspects to what was happening. I always find it interesting how two people can see an event from different perspectives and get a totally different understanding of what happened. Flaherty's Crossing is not a lighthearted novel and may make the reader question some areas of their own life. However, if you are looking for a novel with that little bit of difference then I would heartily recommend this book." "Flaherty's Crossing" is an amazing, emotional story of a young woman, who tries to come to terms with losing her estranged father and, at the same time, mend her troubled marriage. Certain aspects of the story were spooky, but the reader cannot help empathizing with Kate. I found myself emotionally involved with the story, laughing at times and near tears at others. Author Kaylin McFarrin is an extraordinary storyteller with the ability to touch your heart with her words and I look forward to reading more of her works. Brimming with witty repartee, well-drawn characters, creativity, imagination, plot twists, a few surprises and a bit of the paranormal, this story is unforgettable. If you are looking for a terrific story, assured to keep you up until you finish the very last sentence, "Flaherty's Crossing" is the one for you. "Flaherty's Crossing" by Kaylin McFarren is a beautiful story. The author does an incredible job of presenting the story in vivid detail. We are taken into the minds and hearts of the characters. As you read, you will feel the same anguish that they each felt in dealing with their own issues. In your heart, you will also feel their love and their hope for a better future. Even though it is a fictional story, it made me reflect on my own life, and how I shouldn't wait until it is too late to let people that I love know how I feel, or to apologize if I need to. This is a novel that is written with exceptional quality. Readers will truly enjoy this story." "Flaherty's Crossing is an inspirational story about learning to let go and love fully for the sake of love. Who are we under our masks of pain? How would it feel to have those burdens lifted?" "For anyone who has loved immensely and faced a painful loss, this book is a bridge to healing, forgiveness and an open heart." "McFarren's writing is powerful and detail oriented, making the story come alive and creating a suspenseful atmosphere that sustains to the last page. A brilliant exploration of women's fiction."